Chai Lifeline provides vital emotional and social support to children and families struggling with serious illness, assisting them through the crises and challenges of pediatric illness and helping them find hope and joy in every day. Tour de Simcha is an all-female cycling event for cyclists of varying skill levels. Participants raise crucial funds to benefit the children of Chai Lifeline. The event commences on Monday evening, July 15, with a gala pasta party and overnight stay at a luxury hotel; the ride begins on Tuesday morning, July 16. 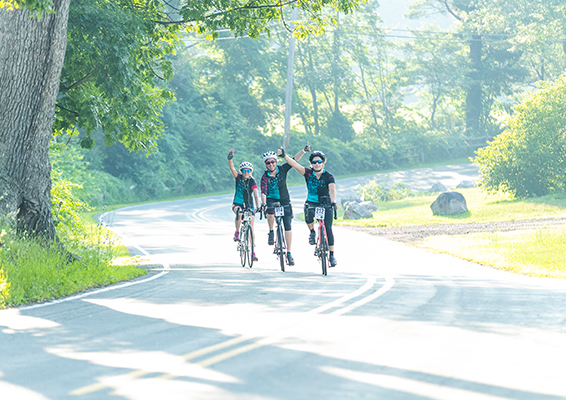 Now in its 8th year, Tour de Simcha offers multiple route options beginning in Princeton, New Jersey , allowing riders to select their routes and level of difficulty. The route is carefully developed to ensure a safe and invigorating cycling experience for all riders. All participants are invited to dine on nourishing, delectable fare at every stage of the ride, beginning with a power-up pre-ride Pasta Party and continuing through every rest stop and to the post-ride BBQ at the staging area. The hearty meals are designed to appeal to every rider’s tastes and preferences while providing much-needed energy and sustenance. Every rider is outfitted with a complete set of gear to showcase her riding pride: a Tour de Simcha team jersey, two insulated water bottles, and assorted paraphernalia emblazoned with the Tour de Simcha logo. The ride culminates in a grand welcome at the World’s Greatest Finish Line in Chai Lifeline’s Camp Simcha itself, an emotional and awesome reminder of the very purpose of the ride. The riders cross the finish line simultaneously and are immediately engulfed in the love and joy that characterizes Camp Simcha, every camper and staff member celebrating their arrival. “Simcha” translates to “joy” – the very essence of Camp Simcha. The seriously ill children of Camp Simcha are granted an unforgettable two-week reprieve from the pain, fear, and challenges of their lives. A summer in Camp Simcha is an extraordinary opportunity for hundreds of children to restore their fighting spirit and renew their determination to defeat illness and suffering.